The spirit and determination with which the CrossRoads riders cover mile after mile, spiting heat, rain, wind and those aggravating flat tires, is a continual source of amazement and admiration. 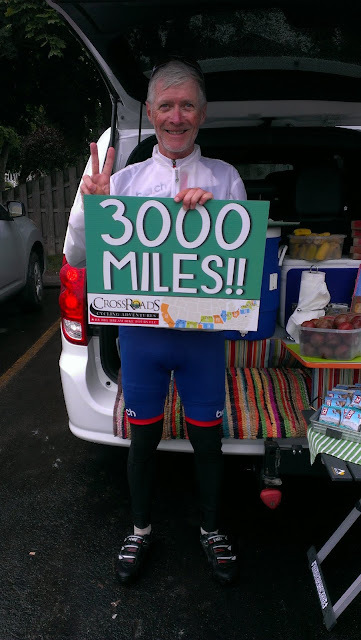 Today they crossed the 3,000 mile mark, with "only" a little over 400 miles more to go. As I was waiting for the group to arrive at the second SAG in Avon, I met this distinguished group of riders (Delaney, Harrison, Charlotte and Reed) and their father. They were so excited about the idea of seeing our CrossRoads group that they stayed for the first arrivals, practising the Swiss chant used to fire on profi racers "hup, hup, hup". And then the big moment as Pete crested the hill and was enthusiastically supported by our cheerleading group. Unfortunately, Emil, who just an hour ago was right behind the first riders, had to endure 2 flat tires and missed the big reception! Avon is a lovley little town, quite representative of a lot of the smaller places we've met, with a town square, shops and restaurants lining the green and friendly, interested citizens ready for a chat. The head cheerleader (Dad) even recommended a place to eat right at the lake in Canandaigua, which Emil and I later followed up on. The SAG was at the local fire station, which also kindly let us use the restrooms. The whole drive from Hamburg to Canandaigua was so lovely, that I didn't even turn on my music so that I could absorb the passing scenery. Rolling hills - some of them quite steep - woods and farmland, towns and villages all contributed to a delightful picture. Since my return from Sardinia I follow your blog with interest. I astonished about your performance and resistance. Well done since now. Keep going and be careful. I wish you success for the amazing trip across the USA. Good luck and hope to see you once in Sardinia.